Although he was the king of the gods, Zeus fell in love with Leda, a beautiful mortal woman. But Zeus could not make Leda one of his wives, because she was already married to Tyndareus [tin-dair-ee-uhs], the king of Sparta. Still, Zeus wanted to be near her, so he turned himself into a swan. One day when Queen Leda was walking among the palace gardens, she saw a beautiful swan being chased by a fierce eagle. The swan swooped down and tried to hide itself in the queen's skirts. Leda felt sorry for the beautiful bird, so she told her servants to chase the eagle away, and she took the swan into the palace as a pet. Little did she know that the swan was actually the king of the gods. The swan followed Leda everywhere. At banquets the queen always gave the bird some tasty morsels to eat, and after dinner as she and King Tyndareus listened to the bards sing about the gods and heroes, the swan would lay its head in her lap while she stroked its soft feathers. At night it slept on a special cushion next to her bed. There was much excitement when the king and queen were expecting their first child, but the king was dismayed when Queen Leda laid two large, white eggs. "You spend too much time with that bird," he said. "You are becoming like a bird yourself." For his part, Zeus was afraid he would be found out, so he flew back to Mount Olympus and returned to his usual shape. Queen Leda and her serving maids took great care of the eggs, and after some time they both hatched. From one came two baby boys, whom the king and queen named Castor and Pollux. From the other egg came two girls, who were named Helen and Clytemnestra [klahy-tuhm-nes-truh]. When the soothsayer was shown the children he told them, "These children will have many adventures and be the subject of many songs. Castor and Clytemnestra are children of Tyndareus, but Pollux and Helen are the children of Zeus, the king of the gods." As they grew up, Castor and Pollux were the best of friends and had many adventures together, which you can read about elsewhere. But Helen and Clytemnestra were not so close. Helen became more and more beautiful as she grew older, and people said that her beauty made it plain that her father was a god. Clytemnestra was not an ugly child, but no one ever paid her the compliments that Helen received, and often this made her angry with her sister. When it came time for a husband to be chosen for Helen, all the lords and princes of Greece came to the palace of Tyndareus in Sparta, because everyone wanted to have the beautiful Helen as a wife. Tyndareus was not sure what to do. So many rich and powerful lords wanted to marry Helen that no matter which one he picked he would anger all the others. There was Agamemnon [ag-uh-mem-non], the powerful king of Mycenae [my-see-nay] whom many other kings obeyed. And there was Odysseus, the cleverest of all the Greek lords. And there was also Ajax, one of the greatest warriors in Greece, who was so big he seemed almost like a giant. The princes began to fear that Tyndareus would never choose anyone to marry Helen, so wise Odysseus came to him one day with a suggestion: Each suitor should first swear a solemn oath that he would abide by Tyndareus' decision, and that if Helen were ever kidnapped by , he would fight to bring her back to her husband. Tyndareus thought this was a very clever idea, and he made all the suitors swear the oath. Then he chose Menelaus [men-l-ey-uhs], King Agamemnon's younger brother. Menelaus was as strong and brave a warrior as his older brother, but he was not as proud and he did not have his own kingdom. So Menelaus married Helen, and Tyndareus promised that Menelaus would rule Sparta as king after him. Agamemnon married Helen's sister Clytemnestra, and Odysseus married her cousin Penelope. After a few years, Menelaus and Helen had a daughter named Hermione who was nearly as beautiful as her mother. And not long afterwards, Tyndareus died, and Menelaus became king of Sparta. That might have been the end of the story, but the gods did not leave them in peace. One day, at a great celebration on Mount Olympus, the goddess of strife threw down a beautiful golden apple on which were inscribed the words "For the Fairest of All." Immediately three of the goddesses claimed it: Aphrodite, Hera and Athena. The three goddesses argued so long and so loud that at last they appealed to Zeus, the king of the gods, to decide which one of them was the fairest. But Zeus knew that whomever he picked, the other two goddesses would be very angry, so he refused to choose but instead picked a mortal man, Alexander, the prince of Troy, to judge between the goddesses. The goddesses were all so eager to win that each one tried to bribe Alexander. Hera offered to make him the king of all the kingdoms in the world. Athena promised he would be given wisdom and victory in battle. But Aphrodite, who was the goddess of love, said that she would give him the most beautiful woman in the world as his wife. Alexander chose Aphrodite, and gave the golden apple to her. Aphrodite knew that the most beautiful woman in the world was Helen, and that she was already married to Menelaus, but she did not believe that goddesses needed to worry about what was right and wrong. Disguising herself as a mortal, Aphrodite brought Alexander to the palace in Sparta where Menelaus and Helen lived. Then she placed a spell on Helen to make her fall in love with Alexander, and helped him carry her away in secret, far from her home, across the sea, to Troy. Menelaus was very angry. He called on all the great lords of Greece, reminding them of the oath they had sworn that they would help bring Helen back if she were kidnapped. Hera and Athena were angry too, because Alexander had not chosen them as the fairest of all, so they sent dreams to Menelaus and Agamemnon promising that they would be victorious if they sailed to Troy to bring Helen back. All the Greek kings gathered their warriors, and together they sailed for Troy in a thousand ships with black sails. 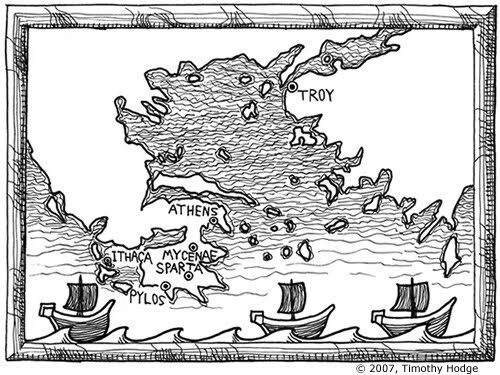 If they were going to have to sail all the way to Troy, and leave their wives and palaces behind, they planned to burn the city to the ground and carry all its treasures back to Greece in order to teach the Trojans a lesson.